In need of some new skillets for your kitchen? You really cannot go wrong with cast iron. Cast iron is an excellent choice for your kitchen for many different reasons. It is incredibly durable, strong, and versatile. You can use it in the oven, broiler, on the stove, even on some grills and campfires. When taken care of, they can be passed down from generation to generation as well. However, there are so many different brands and styles of cast iron skillets, which one should you go with? We will be sharing eight of our favorites with you to help you decide. Nothing is more important to us than ensuring that our reviews are honest and accurate. To do this, we take a few additional steps in our research to make sure it is thorough and correct. We also make sure to thoroughly research the product specifications. By doing this, we are ensuring that if any of our readers buy the product we are reviewing, they know exactly what they are purchasing. There won’t be any surprises or confusion when receiving the item in the mail. This also allows us to identify any potential shortcomings that the product may have as well. Lastly, we make sure to do in-depth research on the company that makes the items. It is important to most customers that they are purchasing products from businesses that they can trust and stand behind. This also gives us insight on a company’s customer service policies, as well as their warranty and return policies. For this particular review of the best cast iron skillets, we will be looking at a few extra specific features as well. We will be considering the overall quality, pricing, durability, and aesthetics for these products. Here are the best cast iron skillets of 2018, listed in no particular order. 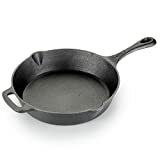 Cast iron skillets can come pre-seasoned, with an enamel coating, or just plain, so there will be an array of different versions of cast iron on this list. The Lodge Cast Iron Skillet is a 12-inch product that has two strong handles, as well as two side lips for pouring out liquids and a handle holder made of silicone. 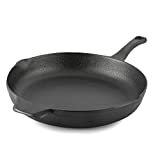 This is an extremely high quality pre-seasoned cast iron skillet that is ideal for cooking, baking, braising, frying, grilling, searing, and any other type of cooking you can think of. With this skillet, you get incredibly even heating and heat retention. This particular cast iron skillet has been recommended by several established magazines and brands like Good Housekeeping, the New York Times, and Food & Wine Magazine. This heavy, durable skillet is large enough to easily feed a family of four, but if you need something smaller (or even larger) Lodge offers many other shapes and sizes as well. If you are interested in purchasing this skillet, you can get it on Amazon for $21.42. The T-Fal Pre-Seasoned Nonstick Cast Iron Skillet is another 12-inch product of extremely high quality. One of our favorite aspects of this skillet is the extra-long handle it has, which even includes a thumb rest to make it very easy to hold when it is full of food. It also has nice pouring spouts to make it easy when you have to empty the pan as well. This pan also comes pre-seasoned, so it is perfect for beginners. However, the food you make will of course taste better with additional use and seasoning. If you are new at using cast iron, you receive step by step seasoning instructions as well. The skillet can be placed in the oven for anything up to 600 degrees, and is able to be used on any type of cooktop – this includes campfires and grills. Want to purchase this cast iron skillet? You can find it on Amazon for $24.99. Next up we have the luxurious Butter Pat Industries Heather Skillet. These are said to be incredibly smooth skillets, with some of the best non-stick quality of any cast iron on the market. Having such a smooth surface makes this product incredibly easy to clean, and the proprietary hand-casting method made this a much lighter skillet as well. This cast iron skillet also has convenient pour spouts, idyllic sloped walls, and a comfortable front grip. It is definitely a wonderfully high quality product that is incredibly durable and beautiful to look at. It has a cooking surface of 8 inches, a diameter of 10 inches, and weighs 4.8 pounds. You also get a 100-year guarantee with this cast iron skillet, so you can return it at any time if you need to. However, this is definitely one of the priciest designs on our list as well. You can purchase this best cast iron skillet for $195.00. Another one of the best cast iron skillets is this one from Utopia Kitchen. This is an extremely affordable option, and is perfect for those who want to spend as little as possible. The Utopia Kitchen skillet is 12.5 inches, pre-seasoned, and does a fantastic job of heating and cooking food evenly. It is said that this product does as good of a job as more professional, expensive options, which really is incredible for what you pay for the item. With this product, you also get a 30-day money back guarantee as well. 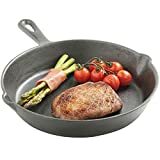 If you are interested in purchasing this cast iron skillet, you can get it on Amazon for only $24.99. The VonShef Black-Pre-Seasoned Cast Iron 3=Piece Skillet Set is one of our favorites because it comes with not one, but three different skillets. You get a ten-inch skillet, an eight inch, and a six inch one as well. These are pre-seasoned pans, so you are able to start cooking with them right away. This also makes it easier for beginners who have never used cast iron skillets before. However, as you use it more and more and season it yourself, it will make the food you make taste better. You are also able to use these skillets with any type of cooktop. They have handles with a hole drilled into them so they can easily be hung from hooks, if you want them to be. These items do not have any helper handles, but they do have the standard pouring spouts on both sides of the skillets. If you are interested in purchasing this set, you can find it on Amazon for only $14.99. Another budget choice that we really like is the Victoria Cookware 10-Inch Skillet. This is a pre-seasoned skillet, making it a decent, easy choice for beginners. It also has an elongated handle, which provides you with better and safer handling when cooking a large amount of hot food. With ten inches of cooking space, you are able to make a pretty large amount of food at once for you and your family. If you are looking for something a little more unique, this cast iron is actually slightly lighter than most of its competition. It is also a fairly light skillet, weighing in at only 4.75 pounds. You can purchase this cast iron skillet for $19.19 on Amazon. Next up we have the Calphalon Pre-Seasoned Cast Iron Skillet. We love the oversized handles that this product has – it makes this skillet extremely easy to both lift and clean. This 12-inch cast iron skillet can be used on any type of stovetops, even including induction. You can also put this product in the oven or broiler. As the title suggests, this is a pre-seasoned skillet, it is also nonstick, and does a great job of ensuring that no food sticks to the pan. The design also works wonderfully when it comes to heating steadily and evenly, and holds heat well to keep your food warm as long as you need it to be. This cast iron skillet also has a full lifetime warranty, giving you peace of mind if anything happens to it. Interested in purchasing this cast iron skillet? You can purchase it on Amazon for $23.99. Last, but certainly not least, we have the Le Creuset Signature Iron Handle Skillet. If you are looking for something luxurious and of the highest quality, this is the best cast iron skillet for you. This 11 ¾ inch skillet is coated in enamel, and is completely resistant to staining and dulling. The black interior looks like your standard uncoated cast iron, but it actually does not need any additional seasoning when you use it. You are also able cook any type of food that you would like in it, which is rather unusual for a cast iron skillet as well. This skillet has a large loop handle which makes the pan very easy to move, even with oven mitts on. You can also use this loop to hang up the skillet as well. One of the most unusual differences between this cast iron and others is that you can place this in the dishwasher as well. You can purchase this cast iron skillet in a wide variety of different colors from Amazon for $199.95. Now that you have seen some of the best cast iron skillets on the market today, there are a few aspects you should consider before making your choice and purchasing one. Make sure you keep your budget in mind while choosing a skillet. There is a huge array of different prices for these products, and knowing what you can afford beforehand will help you narrow down your choices to just one. With this, consider that some products have a lifetime warranty, which will save you money in the long run as well. Another aspect to consider is how many people you will be cooking for. There are several different sizes on our list, and some may be better suited to your family than others. If you have a bigger group to feed, you may want to look at the skillets that are at least ten inches, etc. Which one of the choices on our list is the most appealing to you? If you have tried one of these skillets before, would you recommend it to others? What Makes This Fryer So Special? These days it’s hard to read a cooking blog or turn on an infomercial without someone singing the praises of an air fryer. It’ll make your mouth water just reading all the descriptions of what an air fryer can actually cook or bake - wings, pizza rolls, muffins, fries, veggies - the list of deliciousness goes on and on. Air fryers promise to provide a crispy, crunchy fried taste to just about anything- all of it is fried with AIR, not oil. The end result is food that tastes like it was cooked in a deep fryer but, since you used air, it’s a much healthier version. And chances are you have a kitchen full of appliances so do you really need another one? Before we get into the details of the Chefman air fryer reviews, let’s briefly explain how an air fryer actually works. The Air Fryer Basics – How Do They Work? Basically, there is an electric coil that provides a dry, radiant heat (the same way your electric stovetop does). The heat cooks the food from the inside out. There is also a fan within the air fryer. This fan circulates the radiant heat so you will have a nice, even temperature throughout. This is the same type of convection cooking that is used in a regular oven or toaster oven. The idea is that you’re using a consistent temperature which means your food is evenly cooked. You also typically use a small amount of oil to cook in the air fryer. This tiny amount of oil is transformed into a fine mist as the radiant heat is being circulated. This fine mist of oil actually coats the food as it’s being cooked. The result is food that tastes like it’s been fried in the oil, but since a fraction of the oil was used during the process, it produces a much healthier version of whatever you’re cooking. Not only are you using a healthier cooking process, but the cleanup is a breeze compared to cleaning the oil out of a deep fryer. Especially if the air fryer you are using has a basket with non - stick coating. One aspect worth mentioning is that the cooking time in an air fryer is typically longer than frying. While you may be getting food that tastes as equally yummy as the fried version, don’t expect to cook it in the same amount of time. You can look for a model with a higher wattage of power if cooking time is of major importance. Are any parts dishwasher safe? What makes a Chefman Air Fryer Unique? Chefman Air Fryers come in several different sizes. Whether you are budget - conscience or a budget - buster, chances are there’s one in the Chefman air fryer product line that could be a potential fit for you. The Chefman air fryer lineup starts with the basic model, the Chefman Air Fryer RJ38 - OPP. It features a manual control for the temperature selection. The temperature range for this fryer is 180 degrees up to 390 degrees. The basket size for this model is 2.5L. There is also a 30 minute timer. The fryer basket and tank are considered dishwasher safe, so it’s designed to make cleanup easier on you. This air fryer also includes a 1-year limited warranty. It even includes access to recipes that you can download for use later. The next product in the lineup is the Air Fryer with Digital Display, the RJ38 - P1. This model is similar to the features found in the RJ38 - OPP but instead has a digital user interface. The digital display appears to allow you to program the machine as well. The other difference is a slight temperature range variation - this model cooks in temperatures ranging from 175 up to 400 degrees. The basket is also 2.5L like the manual control version. If you like the digital display version but you have a larger family to feed, then you might want to consider the Large Chefman Air F​​​​ryer RJ38 – OPP - 55. This has all the features of the digital version (timer, temperature range, dishwasher safe basket) but the basket is actually a much larger 5.5L (versus the 2.5L). It’s powered by 1800 watts of power to make sure it can evenly cook the larger amount of food. If you think you might need an even larger basket than this then perhaps you might look at the newest model to the lineup - the Extra Large Chefman Air Fryer RJ38-V2-65. worth the additional cost if you don’t want to be cooking in several different batches. Lastly, if you are looking for an air fryer that does more than just cook or bake, there is another Chefman Air Fryer model available that includes an additional rotisserie function, the RJ38-R8. The same rapid air technology is used to create a rapid roast function as well. It also has the extra large capacity basket size of 6.5L. One other feature that makes this one different than others in the lineup is the large viewing window. This way you are able to see the progress of your food cooking throughout the process. What are Consumers Saying about the Chefman Air Fryer? 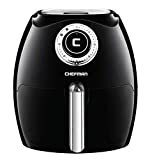 One thing is for certain, some of the reviews for the Chefman Air Fryer are mixed, but overall, they are mostly positive. The number one reason why consumers give the Chefman air fryers a 5 star, thumbs up, highly recommend –to–a-friend type of recommendation is the taste. The bottom line is this machine seems to produce a great “fried” taste without all the unhealthy fat and oil. It can be a great benefit to those who are trying to maintain a healthy lifestyle by cooking lighter foods. Cleaning seems to be another popular opinion for the Chefman air fryer. The dishwasher-safe basket makes it much easier for post - meal cleanup. The non - stick coating lends itself to easier cleanup as well. Price is also another positive attribute for the chefman air fryer lineup. The basic model starts around $39.99 with the rotisserie model topping out at $129.99. When you compare these prices to the other brands that are on the market, you may feel you are getting more for your money with a chefman air fryer. One interesting note is that noise does not seem to be a factor. There are multiple complaints from other brands of air fryer users of how loud the machine is while operating. This doesn’t seem to register on any of the Chefman reviews. If you look closely at the product lineup for the Chefman air fryers, it does tout an ultra - quiet sound operation. Based on the lack of negative reviews this could potentially be a true statement. Ideal for healthy and low fat diet. Consumes much time to fully cook a meal. Customer service after purchase need to improve. Let’s take a look at a few of the challenges that are seen with the Chefman lineup. When you start reviewing all of the customer feedback and comments regarding this product, it seems like the negative reviews are about air fryers in general and not necessarily the Chefman branded products. For instance, one reoccurring theme is found over and over among those who review the product- the amount of time it takes to actually cook the food. This comment occurs across multiple brands of air fryers, again not just the Chefman. In today’s age of instant - everything, it seems consumers don’t want to wait for their food to take a longer amount of time to cook, even if the taste is superior. If you have a family that likes to eat and isn’t very patient, an air fryer may be a little difficult to adjust to. However, if it’s just you or one other person, then the amount of time it takes may not be too much of an issue. The basket size also seems to be a common complaint. Admittedly if you have a large family and you only have the 2.5L basket, you will probably have to cook in multiple batches. With Chefman introducing the Large and Extra - Large versions to address this point then it may be worth upgrading to the larger size to prevent the capacity from becoming an issue. There are multiple complaints of the Chefman units not working after using for several months. Even though the unit does come with a 1 - year limited warranty, this could be a frustrating part of the ownership experience for a Chefman. Specific to these air fryers there are customer service complaints when they’ve had to get in touch with someone from Chefman. If your unit isn’t working and you are within the warranty period, this might get especially frustrating. One comment that is more curious than anything else is that there isn’t an on/off button. It seems you simply plug in the air fryer. There also isn’t a way to start the timer over once you’ve selected the time. Maybe these aren’t deal breakers for you but could be important to remember if you get in a situation where you are trying to operate the machine. Keep in mind that many of the complaints made about the chefman are really targeted to all air fryers, no matter which brand. How do the Chefman Air Fryers Compare to Other Brands? Since the rise in popularity of the air fryers, there have been multiple brands that have entered the marketplace. You will find air fryers by Phillips, Black & Decker, T - Fal, Farberware just to name a few. Not only have most small appliance companies joined the air fryer revolution, you will find several under various celebrity chef names. Compared to other brands though, the Chefman air fryer comes in a variety of sizes and the capacity of the extra-large basket is definitely an advantage. What Do We Think- Is a Chefman Air Fryer worth the Investment? Ultimately that will be for you to decide. 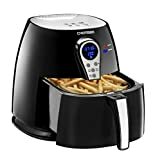 Most of the negative reviews regarding the product are based on the consumer’s experience with air fryers in general - not necessarily that of the Chefman brand. It does appear that Chefman has addressed a couple of the consumer pain points, such as basket capacity and quietness, with models that differentiate it from the competition in these areas. With the Chefman Air Fryer reviews being mostly positive overall, it does seem likely that you will be able to purchase an appliance that cooks and bakes in a healthier manner. All of this for a reasonable price - especially compared to other air fryers on the market—make the Chefman air fryer worth consideration. In need of a new food dehydrator? Look no further. We have compiled a list of what we think are the best food dehydrators of 2018. There are so many different options on the market, and that can make it difficult to choose the best one for yourself. A lot of the choice depends on the pricing, quality, and abilities as well. We will be sharing our favorite options for food dehydrators, as well as what you should consider before purchasing one. For this particular review of the best food dehydrators, there are a few specific factors we will be considering. Performance, overall quality, pricing, and abilities will all be weighed in this review. Here are our favorite choices for the best food dehydrators of 2018, and they are not listed in any particular order. First on our list is the Nesco Snackmaster Pro Food Dehydrator. 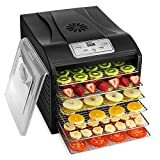 This is an extremely popular food dehydrator, and has been for several years. It has a stackable tray design, which allows the food to dry evenly and thoroughly. This product is extremely exceptional mostly due to the fan mounted to the top of the product, which is a powerful 700 watts. There are five separate drying trays on the Nesco Snackmaster, but you can actually expand this product up to twelve trays which are sold separately. You also get an adjustable thermostat that has a wide range of 95 to 160 degrees Fahrenheit, as well as a reference labeling system to show you what the best temperature for your food is. Other bonus items include 2 mesh sheets, 3 jerky spice packets, a recipe book, and 2 solid sheets. This is a great value for how much you receive for the price you pay. This item weighs 6.8 pounds, is 13 inches tall, 13 inches wide, and 10 inches deep. It is made of BPA-free plastic, and includes the initial five trays. 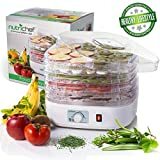 If you are needing something much larger that can hold a considerable amount of food, the Magic Mill Food Dehydrator Bundle is a wonderful choice. Magic Mill is a fairly recognized, well known name when it comes to food dehydration products. This particular product is a 9-tray design, which is not as large as some of their other models, but will still hold quite a bit of food. It comes with the 9 shelf trays, and it has a giant 12 square foot drying chamber to hold them. This product also has a convenient adjustable thermostat and a timer that is built into the design. This unit has a 600-watt fan that is mounted in the back of the model, which is plenty of power for what it needs. It can support almost twenty hours of drying time, and the temperatures range from 95-158 degrees Fahrenheit. Also included with this product is 1 fine mesh sheet, 1 set of oven mitts, 2 fruit leather trays, and a recipe book. It weighs 21.9 pounds, made of stainless steel, and it is 18.7 inches high, 17.5 inches wide, and 14.8 inches deep. 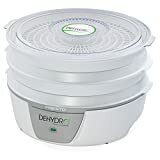 For those of you who want a food dehydrator that is a little cheaper and simpler for beginners, the Presto 06300 Dehydro Electric Food Dehydrator would be an excellent choice. Because this is a budget unit, you do not get either a thermostat or a timer with this machine. Drying food in this machine is just set at 155 degrees Fahrenheit. To make sure it isn’t drying for too long, you will have to check on it periodically. Even though it is a simpler machine, you can still easily dry fruits, vegetables, jerky, spices, and herbs without issues. You get four trays initially, and can purchase an additional four to have a total of eight. This unit has a fan mounted on the bottom of the machine that uses 600 watts. Since you will need to check on your food periodically, the unit conveniently comes with a see through cover on top of the unit for you to peer into. The company Presto also offers a lot of really helpful extension kits. These are fantastic for expanding on your machine later on and learning more about the process of dehydrating food. This machine weighs 7.5 pounds and it is made of plastic. It is 15 inches tall, 6.5 inches wide, and 14.8 inches deep. Next up we have the Excalibur 3926TB Food Dehydrator. Excalibur is an extremely popular and high-quality company when it comes to the best food dehydrators. They have been making these products for over 30 years in the United States. This particular product has 9 trays, and is perfect for making large batches of food. 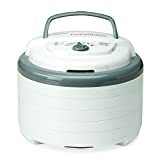 It is also said to dry food much faster than other food dehydrators. Instead of taking four pounds of jerky four hours to dry, they say it will take five hours to dry eight pounds of the meat. It is almost twice as fast, and it will use a lot less energy for the same task. They also give their customers a ten-year warranty, so if you have any issues in that time frame you can have it fixed or replaced. This is a massive unit, providing you with a 15 square foot design. It also has Excalibur’s patented ‘Parallex Horizontal Airflow Design,’ which keeps the food heated evenly, and ensures that the food enzymes stay active while bacteria, yeast, and mold are killed. This product also has the patented ‘Hyperwave Fluctuation Technology’ as well. You are given a built in timer that you can set up to 26 hours if you need to, and an adjustable thermostat with a range of 105-165 degrees Fahrenheit. The machine weighs 22 pounds, is 12.5 inches tall, 17 inches wide, and 19 inches deep. The TSM Products Stainless Steel Food Dehydrator is an extremely attractive and durable option for a food dehydrator. This entire product consists of stainless steel, which makes it resistant to corrosion – no matter what you do to it, it will survive. The design has a huge 800-watt heating source and fan, as well as five huge shelves and an adjustable thermostat. Everything inside of this unit is able to be easily removed and easy to clean. This product also has nine different air vents on it, which allows the moisture from the food to easily escape when it is drying out. 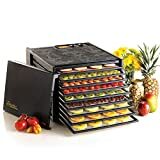 This food dehydrator weighs 20 pounds, has five trays, and is 11.5 inches high, 16.75 inches wide, and 19.25 inches deep. Last but certainly not least, we have the NutriChef Food Dehydrator Machine PKFD06. This is a machine that we would recommend for beginners who are interested in making jerky. It has five high capacity rotating trays, and a two-vent system that makes it perfect for home or camping trips. This machine is rather small, but it works perfectly for any type of meat. It is actually specifically made for drying meat and making jerky. Now that you have seen all of our favorite options for the best food dehydrators of 2018, there are a few factors you should consider before making your purchase. Make sure that you have a budget in mind, as this will help you eliminate any options that you cannot afford. Since there are so many options, it is good to narrow it down as much as you can. If you go into the process of choosing a food dehydrator with a set range that you can afford to spend, you are less likely to be disappointed with your choice as well. Also consider what types of food you want to cook, as well as how much you will need to make. Some of the models on our list would be appropriate for a large group or family, while others might only be good for a few people or types of food. 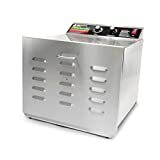 For example, the NutriChef Food Dehydrator Machine PKFD06 would be the ideal choice if you are someone who hunts frequently or just likes to dry a lot of meat out. Whereas you would not want to purchase that product for fruit or vegetables. We hope that you were able to find the best food dehydrator for your needs on our list today. While it can be difficult to know what to purchase or where to look, having the best options laid out in front of you can be a great help. For those of you looking for the perfect food dehydrator, which option on the list looked the most appealing to you? If you have purchased one of these machines previously, what were your thoughts on it? Do you make toast at 350 degrees? Are your kitchen appliances dated? The days of the pop-up toaster have long since passed. Toaster ovens have grown up since their humble beginnings. Choosing the right toaster oven will bring great versatility and convenience to your kitchen. The cooking power, footprint, and clever design of the newest toaster ovens is ingenious. You’ll be surprised at how much you can get done with this counter top device. The search for a toaster oven is on. You’re googling. You’re checking vendors, you’re price-comparing. Bravo! But there is so much information, there are so many toasters out there. It’s shocking! At this point, you just want to buy the next toaster you see. You’re right. There are too many to choose from. How to make the best choice for your needs in the face of a market so packed with options? Are all these toasters and toaster ovens really that different? What brand can you trust? The quick answer is that yes -- they are different. There are poorly built toaster ovens out there. The overwhelming number of options alone suggests that there are bad options out there. But there are also good options and great options. Researching a well-known and trusted brands is a great way to start. You want to choose something reliable, something that will meet your needs, and something that will last. You’re not about to buy a junky toaster that falls apart or stops working. You’re not about to shop for a toaster again in less than a year. Read on to find the best options to the classic GE toaster oven. Most major makers of small kitchen appliances make a toaster oven. A brief list of reliable manufacturers that make good options would have to include Hamilton Beach, Oster, KitchenAid, Farberware, Cuisinart, Breville, Panasonic and Black & Decker. Some of these brands make more than one, so it is helpful to think a bit about what you need your toaster oven to be able to do as you compare models. Toaster ovens are better named “countertop ovens” since really, they are just smaller ovens that run on less power and take up less space. It’s worth mentioning that they are more efficient than large wall ovens as well. If the dish you want to cook fits into the toaster oven, chances are it will cook better in there as well. You want a toaster oven that’s more than just a cheap tin hot box. You want to look for multiple functions, multiple interior racks, a good temperature range and accessories. Diving into the history of small appliance manufacturers is fascinating and can lead you down many wild rabbit holes of information and the life cycle of corporations. A number of the companies listed above have long manufacturing pedigrees. Hamilton Beach, Black & Decker, Farberware, Oster, KitchenAid and West Bend are all examples of companies that were started in the Northeast or upper MidWest between 1895 and 1920. These companies started variously as manufacturers of drink or baking mixers, power tools and animal shearing tools. Quite a variety! By some accounts, the Australian company Breville started off making radios and mine detectors for the war. Many of these companies have been in existence, innovating and developing products, for well over 100 years. They have stood the test of time, markets, and radical change. All are reliable makers and offer great alternatives to the GE toaster oven you set out to find. When Did Toasters Get So Complicated? Here again, we face a potential deep dive into obscure history that will connect our search for a GE toaster oven to the (very excellent and universally loved) invention of sliced bread, and we’ll be getting way off topic if we go there. Suffice it to say, a Scotsman is credited with the invention in 1893. Thank Alan McMasters tomorrow morning at breakfast. Toasters were modified and improved upon through the 20th century in a wide variety of ways, bringing us the pop-up feature, the conveyor toaster, and eventually the toaster oven. Toaster ovens have carried on this evolution to give us the countertop convection ovens that we love and rely on today. Companies like Farberware, one of those 100+ year strong American entities mentioned above, now make toaster oven that can bake cakes, pizzas, and even roast a five-pound chicken. If only Alan McMasters had known where his original idea would go! A Cake in a Toaster? I know, that sounds both weird and messy, not to mention improbable, but it is where the technology has taken us. It works. In very nearly the same footprint as a classic GE toaster oven, you can have an appliance on your countertop that will do most anything your wall oven can do. In truth, the toaster oven has become a small full-fledged oven that many households use more than their conventional oven. Buy the right one, and you’ll find that you put it to good use right away. Keep this scope of possibilities in mind as you hunt for your toaster oven. One of the best developments in the technology of toaster ovens is how quickly they heat up. Compared to the huge volume of a wall oven, they’re small. They need to heat up less than 1 cubic foot of air and steel. Think about what you cook on a daily basis. We’re not making Thanksgiving turkeys every day -- we’re heating up leftovers, melting nachos, defrosting pot pies or baking pizzas. Toaster ovens are ideal for these types of uses. Most of the cooking we do is mid-to-small volume. And who doesn’t want to save some time and energy (and money for that matter) by using a more efficient device to cook? Toaster ovens are very efficient, especially for the normal day-in and day-out needs of most families. Beyond heating up quickly, toaster ovens cook quickly, especially models that use convection technology to move the heat. Capacity. A toaster oven with a capacity of 25 liters (.75 cubic ft) is a great size for mid-range meal uses. Plus, you can toast a lot of bread in there! Multi-function. Many toasters will feature a variety of cooking functions and a broad temperature range. Warranty. Look for a toaster that comes with manufacturer warranty. How Much is .75 Cubic Feet? I know, math! Sorry to have to drop technical specs on you, but that’s how these units are rated. Those numbers are best envisioned in terms of options. In a toaster oven of that size, you can roast 5-7 pounds of chicken (5 on a spit, 7 on a pan), you can bake (2) 12” pizzas at once -- provided you have multiple racks. You can also toast 6 slices of bread at once. You can bake a pie or several potatoes, you can broil fish fillets or steak. Most meals will fit. Never again will you turn the oven on just to make toast, or worse, to reheat something that the microwave heat and ruin. By now, you might be better served if you stop thinking about the toaster as just a toaster and start thinking about it as an oven. In that light, you might be surprised at how many different cooking processes you actually use. A multi-function toaster oven can meet many of those needs. A well-rounded toaster oven should be able to bake, broil, toast and roast. Higher end models will also have convection and rotisserie options. These different functions will not only encourage you try new cooking methods, they will make the process easier. Since the toaster oven is on your countertop, it is closer, easier to manage and easier to monitor. Whether you’re cooking for six or just for two, reheating casserole, or broiling salmon, a toaster oven will meet your needs and make the task easy. Warranties are good signals from a company that you are buying a product you can trust. Companies that offer 1-2 year warranties and limited warranties are telling you that even after using the unit more than 1000 times, they’ll stand by its craftsmanship. A lot can happen in a year or two. Knowing that the manufacturer stands by their product indicates you’ve found something far more likely to be worth the money. A warranty can help bring peace of mind to the purchase process. You can plan on continuing to use oven for years to come. They Save Time - Toaster ovens heat up much faster than big wall ovens. They use less energy as well. Convection ovens will cook evenly, rapidly, efficiently. Last, being compact, they save time, energy, and potentially a little money. Safety - The toaster oven can be used to make after-school snacks -- no need to turn on the stovetop burners. A little peace of mind will come knowing that. Use It to Cook Most Anything - A toaster oven that features a broad temperature range (from 150 - 450 degrees F is ideal) can cook anything from slow roasted meats to high temperature baking. 450 degrees F will cook pizza! Better Use of Space - The footprint of most toaster ovens is usually just a few inches greater than a regular toaster. You can toss that old toaster out right away. The trade-off of what the toaster oven can do by comparison is no contest. What are the drawbacks here? The drawbacks are relative. It really depends on what kind of cook you are and how you use your kitchen. If you use the oven most nights, you’ll find that many (if not all) of those dishes can be made in the countertop toaster oven. It is generally just a question of scale. If you are more of a stove top chef, you might get less use out of the toaster oven than others. The main drawback for most people is the size. The size of the footprint of your basic toaster oven is usually around 16” wide x 13” deep and 9” high. Higher end models are bigger and can measure up to at 20” wide x 17” deep x 14” high. For some households, that is more appliance than they want on the countertop. As we mention above, look for a toaster oven with a full range of functions -- broil, toast and bake. The best bake function temperature range will span from 150 to 450 degrees F. A timer that will run at least one hour is also essential. Some ovens will include useful hardware. Ideally, you’ll find one with multiple (at least 2) baking racks at adjustable heights, a crumb tray, and in deluxe models, a rotisserie set and drip pan. An interior with 3 sets of rails to adjust the rack height is preferable. When baking, you use the middle and bottom rails, when broiling the middle and top rails will provide the best results. Rotisserie accessories will fit into holders in the middle rack. When you’re done cooking, cleaning up should be easy. The crumb tray will help keep foods from burning on the inside of the oven and can be removed (once cool). Most units will have accessories that are dishwasher safe, including the baking racks and spit set. The last aspect to bear in mind is ease of use. Most toaster ovens use dials to control temperature, function and time. You don’t need a digital readout, or the ability to program the oven. Twisting knobs is easy and more than adequate. There is hardly room for a sophisticated control panel anyway. Beyond, dials are intuitive. The simple interface is a certain benefit if you plan to teach the kids use it. That oven is out there. It will toast bread perfectly, and it will perform a half dozen other cooking functions that are way more useful and even more common than toasting bread! Bear in mind the specs and features we discussed above as you consider your options. Make your toaster oven work for your household! Besides ordering from fast food chains, what quick meals can we serve on our dinner table? Let’s face it. With our fast-paced environment, we lack time to cook an entire meal for ourselves and our family. From long days at work to the children’s extra-curricular activities; this leaves us with little room to prepare a healthy meal. This list is will show you 98 quick meals that any busy person can make. These meals will take 45 minutes tops and your family will be so happy that you found a way to make a worthwhile meal. The following quick meals can be used all throughout the year. We tried to keep contain this list with meals that will only take 45 minutes or less. Just because you won’t be cooking for hours, doesn’t mean these meals are skimpy or dull. Normal spaghetti will do just fine, but sausage cooks just a little quicker than beef. Grab a box of Texas Toast from the freezer section and add sauce, cheese, and pepperoni. Grab your favorite sausage and some alfredo sauce. This alfredo pasta is sure one of the quick meals to wow your family. Stromboli may seem like a complicated dish but it really isn’t. This quick meal only calls for a few key ingredients. Featured image: CC by 2.0, by Jeremy Noble, via Flickr. Enlisted in our favorite quick meals are Calzones. You can buy them in the grocery stores and just heat them in the microwave or regular oven. Featured image: Video screen capture, Food Wishes, via YouTube. Cook turkey meatballs with zucchini noodles. For the noodles, you will need a noodle cutter. Children will list this as one of their favorite quick meals. Featured Image: CC by 2.0, by Jules, via Flickr. Who doesn’t like tuna? Pack your tuna up and put it on a hamburger bun or sandwich loaves. Add lettuce and tomato to top it off. Featured image: CC by 2.0, by Bert Wagner, via Flickr. Catfish cooks the quickest out of most of the fish in the sea. Just add apple and celery into your coleslaw to make this complete. And, next thing you'll know, you're serving at least two quick meals in one plate. Image: Public Domain US, by Brandonrush, via Wikimedia Commons. Fry or bake some tilapia. Add sweet and sour sauce and your favorite side or salad. Featured image: Video screen capture, A La Carlene Dishes, via YouTube. Find ready-to-cook mini pancakes at the breakfast aisle at any grocery store. Pop these in the oven and scramble some eggs too. The bacon should cook in about 15 minutes tops. Featured image: Video screen capture, As/Is, via YouTube. Some people would rather cook their tilapia in a pan rather than an oven. Make sure to add plenty of butter. Avocado is the new health wave. Avocado slices actually go well in quesadillas. The truth is, veggie tacos are so much quicker to make than meat filled tacos. Lo Mein is among the favorite quick meals at Chinese restaurants. It’s pretty quick to cook as well. Featured Image: CC by 2.0, by The Finishing Company R.V., via Flickr. Anyone who loves a good Asian dish will love this. Simply cook these noodles and add your favorite sauce. Featured image: Video screen capture, Yum, via YouTube. Grab some pre-cooked chicken and add it to your fried rice. If you have time, peas and scrambled eggs will work well too. Featured image: Video screen capture, Seonkyoung Longest, via YouTube. This quick meal is a favorite among young ones. Grab a regular sized bag and top it with cheese, pizza sauce, and pepperoni. Pop it in the oven and you’re done. Image: Public Domain, Sean Busbey, via Wikimedia Commons. Stir fry is a super-fast dish. Fry your rice and add some veggies. Buy some soy sauce for extra flavor. Find your favorite beans and make a chili out of them. Feel free to add corn and tomato. Featured image: Video screen capture, Veggie Fit, via YouTube. Macaroni and cheese is great for any time of year. This comfort food won’t take long to cook if you use the right ingredients. Image: Public Domain, Texasfoodgawker, via Wikimedia Commons. Use whatever pasta noodles you have stored in your pantry. Add some olive oil and seasoning after cooking for a delicious dish. Featured image: Video screen capture, Bon Appétit, via YouTube. Sometimes, you can find a brand of noodles ideal for making quick meals. You will only have to bake instead of boil and then bake. This will make the process even faster. Ziti is a pasta dish which uses 3 different types of cheese. One of these can be ricotta. This dish is quick because you only need to cook the noodles and bake the cheese on top. Featured image: Video screen capture, Kitchen Nostalgia, via YouTube. This unique recipe is great for busy nights. Penne or spaghetti noodles should work fine. Alfredo doesn’t take long to cook when you use a store-bought jar of sauce. Cook the noodles and add broccoli. Featured Image: CC by 2.0, by An Mai, via Flickr. Bake some chicken strips and add to your favorite type of rice. Serve them together for a complete meal. You’ll want to use quick rice for this quick meal. Featured image: Video screen capture, Crunchy Creamy Sweet, via YouTube. Use sweet and spicy sauce to top your baked chicken with. Turkey meatballs give a great variance to meatball recipes. Garlic Bread and cheese should go well with this dish. Featured image: Video screen capture, Tasty, via YouTube. This is one of the healthy quick meals that can be made in 30 minutes. Featured image: Video screen capture, Devan Nielsen, via YouTube. Find some instant rice, cook your chicken strips and you’re all done with this quick meal. Grilled cheese always goes great with Tomato soup. Although this dish may sound fancy it’s actually pretty simple to make. Add garlic and mushroom to your baked chicken. Featured image: Video screen capture, Cafe Delites, via YouTube. This meal consists of cooked chicken strips, Cajun sauce, and peppers. Featured image: Video screen capture, Tess Cooks 4u, via YouTube. This meal is perfect for cold nights in the fall or winter. Add beef broth, chopped beef, and noodles to a dish and you're done. This quick meal is a go-to for many families. Beef burritos can be made quickly. Just throw in your favorite cheese and veggies to the mix. Cooked chicken strips with black or brown beans will fit nicely into a burrito. Some people like to add sour cream for dipping their burritos in. Chef’s salad usually consists of your favorite meat, cucumbers, tomatoes, and cheese. Cheddar or Mozerella will do just fine. You can bake an entire enchilada meal in about 30 minutes or less. Make sure to add your favorite veggies to the mix too. Featured image: Video screen capture, Tami Dunn, via YouTube. Nachos are great for any time of the year. Put together your favorite nacho chips and the veggies of your choice. Don’t forget the black beans. Featured Image: CC by 2.0, by Ginny, via Flickr. Use drumsticks or small chicken wings for a quicker cooking time. Glaze them with honey and garlic for a delicious dish. This meal is both quick and unique. You probably didn’t think of adding sloppy joes to muffin tops. This quick meal is perfect for winter months. You can always substitute the beef with chicken if you want. Featured image: Video screen capture, RecipeTin Eats, via YouTube. Who doesn't love a good meatball? Before cooking them, stuff them with cheese or veggies. Featured image: Video screen capture, OnePotChefShow, via YouTube. A quick macaroni recipe with ground beef will do just fine. This meal is hearty and quick. Featured Image: CC by 2.0, by my_amii, via Flickr. If you’ve never tried stuffed peppers you’ll definitely want to. They’re easy and delicious. Bake a bell pepper and add your favorite veggies and meats on the inside. Image: Public Domain US, William Andrus, via Wikimedia Commons. Sliders are quick since they're so small. You won't have to worry about making full-sized hamburgers. They'll cook quickly and can be put together much faster. Kids will love this quick meal. Featured image: Video screen capture, mahalodotcom, via YouTube. Chili dogs are always a fun and easy dinner. Grab some hot dog buns, hot dogs and a little bit of pre-made chili. There you go this quick meal is complete. Cheddar cheese can always be added on top for extra flavor. Featured image: Video screen capture, Mack Michaels, via YouTube. This delicious sandwich consists of a slab of beef with any toppings of your choice. Make sure you don’t forget the French dip recipe to dip the sandwich in. Image: Public Domain, Davinic, via Wikimedia Commons. Beef stir-fry doesn't take very long to cool at all. Chopped beef, fried rice, peas, and carrots will do the trick. Instead of using regular sloppy joe sauce and beef, go ahead and add some chili to the mixture too. This will give it a little more flavor. Remember, chili can be last for days so you may want to make this in bulk. Many Asian themed restaurants serve this dish but you can make it right from home. If you like soy sauce you might want to add that to the mixture for flavor. Image: Public Domain, Jon Sullivan, via Wikimedia Commons. This can be prepared within 30 minutes. Use beef or steak shreds for this recipe. There’s also a special Mongolian sauce recipe you’ll want to try out. Featured Image: CC by 2.0, by Craig Dugas, via Flickr. Orange chicken has become ever popular. So, it is a not a surprise that it made it in our list of quick meals. Just grab some chicken and your favorite orange sauce recipe. This dish will be tangy and sweet at the same time. Image: Public Domain, NICOLAITRI, via Wikimedia Commons. Sesame Chicken may look similar to orange chicken but the sauces aren’t that similar in taste. Sesame chicken will be a little saltier than orange chicken. Make a pot of spaghetti and grab hard or soft tacos shells. This makes the dish just a little more unique. And, it won’t seem like you’re eating just spaghetti for dinner again. Featured image: Video screen capture, Culinary Hill, via YouTube. Taco pie can be baked within 20 minutes in a pan. Stuff the pie with the insides of the taco and let the crisp outer shell bake to perfection. Featured image: Video screen capture, BuzzFeedFood, via YouTube. This salad can be prepared with just about anything you want. Strawberries, walnut, onion, black olive, banana pepper or whatever else you like in a salad. Toss the beans, avocado, tomato, corn, and cheese into a skillet pan. After letting it simmer for a few minutes, you can take it out and it’s ready to eat. Featured image: Video screen capture, Sarah Koellmann, via YouTube. This cold dish can be prepared in a bowl. Chop up your favorite veggies and mix them together. You can include meat if you want to as well. Featured Image: CC by 2.0, by flippinyank, via Flickr. This southern dishes usually calls for rice, peppers, ground beef, and cheese. Bake it for about 20 minutes and you're ready for a quick meal. Featured Image: CC by 2.0, by Jeff Attaway, via Flickr. Choose your favorite brand of tortilla wrap and make a wrap complete with ground beef, corn, tomato, and beans. You can also put chicken strips in as a beef substitute. Featured image: Video screen capture, Joanna Cismaru, via YouTube. A nice pot of chicken casserole goes great with a baked potato. This quick meal is sure to fill you up. Featured image: Video screen capture, The Spicy Apron, via YouTube. Brown rice tends to be healthier than white rice. It has whole grains and tons of fiber. Chickpeas or garbanzo beans can add the nutrient protein to this quick meal. Featured image: Video screen capture, Jill McKeever, via YouTube. Use some of your favorite vegetables for this dish. You can also pick the pasta of your choice to make the dish unique. Image: Public Domain, Glen Edelson, via Wikimedia Commons. Most Greek Salads feature tomato, quinoa, feta cheese, onion, and cucumber. Cajun Chicken tends to be on the spicy side. This dish is great for those who like tons of flavor. Featured Image: CC by 2.0, by kae71463, via Flickr. Pot pies are pretty easy to make especially if you use a pre-made crust to cut down on time. Fill this crust with frozen vegetables like carrots and peas. Next, add your chicken and bake it in the oven with a little bit of chicken broth. Fried chicken is so simple and easy to make anyone can do it. Choose your favorite side to go with this quick meal. Buy your favorite maple glaze or sauce and add it to a cooked chicken sandwich. Usually, you would bake the chicken meat you'll use for the sandwich. Kids will love this quick meal. Crumble Ritz crackers over the baked chicken. Add a little water or oil so that the crumbs will stick to the chicken. The finished product is a deliciously wrapped ritz cracker chicken. Featured image: Video screen capture, Life as Zorayda, via YouTube. Use mushrooms and rosemary or basil to coat your chicken. It will only take 30 minutes to complete. This soup uses an assortment of different veggies. Soups are generally pretty easy to make. This recipe isn’t very common but it’s one of the great quick meals. Tomatoes and Cauliflower won't' take long to cook at all. Roast them in an oven and pair them with your favorite pasta noodles. Season with salt and pepper. This veggie pasta can be prepared quickly while providing tons of nutrients. Get some romaine lettuce, avocado, and corn and toss it into a salad. Avocado pieces can be chopped up into little cubes for easier eating. Featured Image: CC by 2.0, by Adam S, via Flickr. This quick meal features an Italian chicken dish. Featured Image: CC by 2.0, by Alpha, via Flickr. Most people probably don’t know this quick meal. White beans and pesto go great together and broccoli will add extra nutrients to this dish. Featured image: Video screen capture, Everyday Food, via YouTube. This dish uses bow tie noodles, cheese, and alfredo sauce. Feel free to add your favorite vegetables to this dish too. Featured image: Video screen capture, CookingwithSugarTV, via YouTube. Grilled cheese is a quick and easy food to prepare. Potato soup only takes 10 to 20 minutes to cook from scratch. This is the ultimate quick meal combo. Cheeseburgers are always a quick meal. You can always add chips or baked beans to complete this meal. This delicious Italian dish calls for olive oil, tomatoes, black olives, anchovies, and garlic. Featured Image: CC by 2.0, by Jeremy Keith, via Flickr. Grill your chicken in a pan or bake it. Make sure to add your favorite brand of soy sauce for a flavorful meal. Most people have heard of this quick meal. It only takes 30 minutes or less to prepare. Featured image: Video screen capture, Damn Delicious, via YouTube. You probably didn’t realize pesto can be used for more than just pasta. Featured image: Video screen capture, food jazz, via YouTube. Meatloaf is usually made from beef. It will only take about 25 minutes to fully prepare this meal. Sausage doesn’t take as long to cook as other meats. This dish can be created in a skillet. Featured image: Video screen capture, Sandee Fuell, via YouTube. Chop up pieces of sausage and add it to a pan of sliced apples. Featured image: Video screen capture, Grumpy Home Chef, via YouTube. Use barbeque chicken as a filler for your favorite flatbread. Featured image: Video screen capture, Chop Secrets, via YouTube. Kids will definitely like this quick meal. Tater tots can be used to make a nutritious Shepherd’s pie. Cuban sliders are similar to regular sliders. The difference is they’re much spicier. Featured image: Video screen capture, Kraft Recipes, via YouTube. This dish can be cooked in under 45 minutes. This is one of the quick meals for all the vegetarians out there. Get a large jar of Ragu sauce and make extra food for later in the week. Featured image: Video screen capture, Fresh from the Tube, via YouTube. Make this dish in the form of a mixed meal or cook these ingredients separately and serve them separately. Either way, it won't take too long to prepare. You’ll need the perfect honey garlic sauce recipe to top with your beef. Featured image: Video screen capture, NAILSJAMIEBE, via YouTube. Ramen noodles are a staple in many Asian countries. Just add some vegetables to this stir-fry and you’re done. Featured Image: CC by 2.0, by jeffreyw, via Flickr. Lettuce, avocado, and tomato will complete this delicious burger. Featured image: Video screen capture, Paleo Panther, via YouTube. Italian sausage carries just the right amount of flavor. Some people serve as a breakfast dish as well.